This month marks the publication of an important article in CJSM, the Canadian Academy of Sport and Exercise Medicine Position Paper on Abuse, Harassment and Bullying in Sport, and highlights the issue of safeguarding within the sporting environment. I am sure that if we reflect on our own experiences whilst working within sport, most of us will be able to recollect incidents highlighting the important issue of safeguarding within the sporting environment. The problem of unacceptable behaviours is probably more widespread than we realise due to the likely under-reporting of events, longstanding cultural precedents, and the fine line that exists between acceptable strategies aimed at getting the best out of sports participants and unacceptable behaviours. There have been some recent important claims and disclosures of unacceptable behaviours from prominent sporting personalities, including the legendary American boxer Sugar Ray Leonard, UK Olympic diving hopeful Tom Daly, and Australian umpire Daryl Harper amongst others. The CASEM paper highlights the definitions of the terms abuse, harrasment and bullying, citing the paper by Stirling published in the BJSM in 2009 ‘Definition and constituents of maltreatment in sport: establishing a conceptual framework for research practitioners.’ Risk factors and signs and symptoms of unacceptable behaviours are discussed together with recommendations for healthcare professionals working in sport, and practical advice on what to do in the event of disclosure and suspicion is given. In addition, there is advice on primary prevention, and on protecting oneself from spurious allegations of unacceptable behaviours. Sheldon Kennedy, former NHL player with Detroit Red Wings, Calgary Flames and Boston Bruins, is perhaps as famous for his disclosure of sexual abuse by his former coach and his work as a spokesperson for the prevention of unacceptable behaviours as he is for his fame as an NHL star. Sheldon founded Respect in Sport in 2004 together with Wayne McNeil, and their website provides an online certification program, together with links to other resources. 2) The UK-based National Society for the Prevention of Cruelty to Children website has a section devoted to safeguarding children and young people in sport, although the general principles and issues highlighted are equally applicable to adults. The NSPCC child protection in Sport Unit (CSPU) was founded in 2001 to work with UK Sports Councils, governing bodies and others to reduce risk to children of abusive behaviours during sporting activities. The website has a number of excellent resources including a series of videos of scenarios highlighting unacceptable behaviours to raise awareness. 3) The Bullying UK website, has a section devoted to the issue of bullying in sport and discusses amongst other things, important issues to consider when introducing a sports club anti-bullying policy. 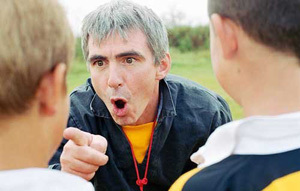 4) The youth sports psychology website blog has a section devoted to bullying in sports, and offers an opportunity for parents and others to share their experiences of unacceptable behaviours within the sporting environment and for mutual support. 5) Women Sport International’s sexual harrasment task force discuss sexual harassment and signpost to resources on their website. They also offer support for victims and for those who require further information. 6) The UK Government charter for action against homophobia and transphobia in sport, with signatories including the UK Football Association, Rugby Football League, Rugby Football Union and Law Tennis Association have their own facebook page which seeks to raise awareness of issues particularly relevant to these forms of unacceptable behaviours within sport. The responsibility for safeguarding individuals within the sporting environment rests on the shoulders of all of those who are involved in sport, and this month’s CASEM position paper in CJSM acts as an significant resource and a reminder of this important issue. It’s free, so please signpost your colleagues to it as raising awareness is one of the most important steps we can all take. Awareness, planning, vigilance and effective action when necessary are key when it comes to preventing and dealing with unacceptable behaviours within the sporting environment. CJSM would like to hear your views on safeguarding, and your experiences.